After the location of the kayak seat has been determined, sit in the kayak and determine the best location for the foot braces. The position should allow for adjustment, both shorter and longer, and for height (where your heel rests). With the boat inflated, use a pen to mark the location of the holes in the rails on the sides of the tubes. Alternatively, the backing fabric in the kit can also be used as a template for the holes. 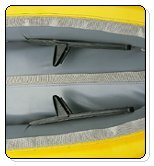 Deflate the boat and open the zipper to access the inside of the outer shell where the rails will be installed. Use a hammer, backing block, and a 1/4" diameter punch to punch the marked holes in the outer skin of the boat. The backing block is to provide a solid surface for punching the holes. BE CAREFUL NOT TO DAMAGE ANY OTHER PART OF THE BOAT WHEN PUNCHING THE HOLES. Place a washer on each of the bolts. Push the bolt assembly through one of the end holes on each of the fabric washers. Bring the other end of the fabric washer over the bolt head and insert the bolt shaft through the remaining end hole. The fabric washer protects the AIRECELL from the bolt head. Position the PVC reinforcement so that all holes line up. Push the bolt and fabric washer assembly through the PVC reinforcement on the outer skin of the boat and then thread the bolt into the foot brace rail. Tighten with a wrench by inserting it through the center hole of the fabric washer. Repeat for all bolts on both rails. Remove all tools and material from the inside of the kayak and realign the AIRECELL. Close the zipper, replace the split ring, and inflate the tubes.